For anyone planning a trip to Hawaii, here’s a list of some of the beaches – tried and tested! During the daytime, Waikiki was crowded with tourists. During the evenings, locals came out for surfing or bodyboarding. But Waikiki’s maybe not the best spot for sunbathing unless you want to do it crowded with the masses. Not my idea of fun. And, gathering from previous comments on my blog, not yours either. So on our beach days, we’d walk a bit further from Waikiki to get some space. Our solution: Kapiolani beach park. Just walk along the beach (towards Diamond Head, looming in the background) and you’ll find some more space for your beach towel. Families and couples spent time in the water. There’s also the nice, shady option of sitting on the grass under the palm trees. Restrooms are conveniently nearby. We visited the mall in Ala Moana a couple of times but didn’t stay there for a beach day. This beach was very quiet, though, and there were hotels nearby. More of a local feeling already, and you didn’t even have to go far from Waikiki! There were picnic tables there and beach showers. A snorkeling spot. Get there in the morning because it gets crowded and only a limited number of visitors are accepted per day. It’s worth it, even just for the views. There were plenty of different types of fish to see quite easily, while staying in the shallow reefs. You can get there easily by bus from Waikiki. A nice idea for a day trip if you want to see the island and the spot where the pros surf. Rough waves. A calm beach with a local feel to it. In my post I said it might be the most beautiful beach in the world and I haven’t changed my mind! The weather was perfect in November-December and as you can see, there’s plenty of peace and quiet. Kaanapali is a long beach, divided in two: north and south of Black Rock. We stayed in the north part, which was much calmer than the commercial south part. There were days when we were almost alone on the beach and even at its worst, it wasn’t crowded. Black Rock is a spot for snorkeling with coral reef fish and turtles, though there weren’t as many different types of fish as at Hanauma Bay. The water’s a bit deeper at Black Rock, so you can dive with your snorkel. Kaanapali is great for relaxed beach walks. We’d walk north until the sun started setting and then we’d turn back. We saw people relaxing on the terraces of what looked like holidays condos with a glass of white wine and an ocean view. Looked like a nice life. I don’t remember spotting much underwater but hubby saw turtles. I got cold, despite the borrowed wetsuit top, and I got out of the water earlier. 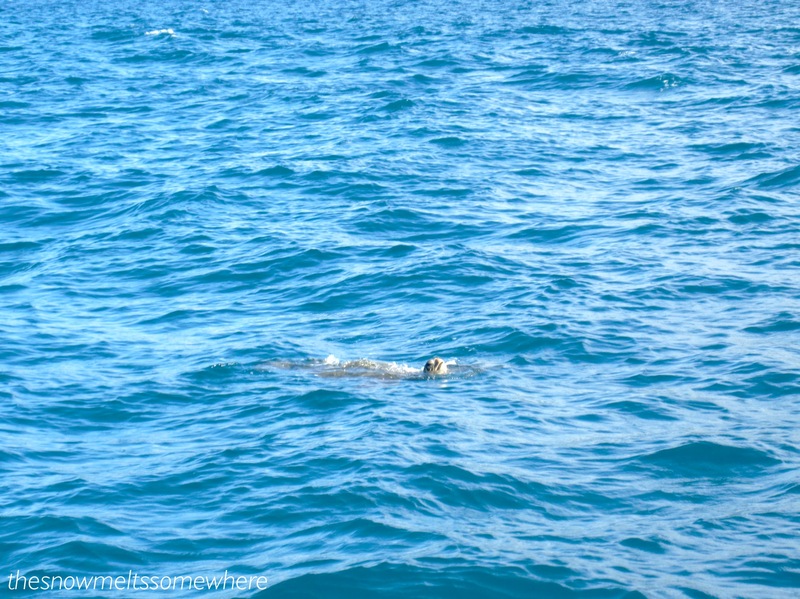 But later, we spotted a surfacing turtle from the boat. I’ve posted pictures of Diamond Head, Oahu, where we hiked, and Haleakala, Maui, which we visited on a day trip. We also walked around Honolulu and saw locals living their daily lives, waiting for a bus or carrying a briefcase – the kind of normal life which I like looking for wherever I travel. We happened to witness the filming of the TV show Hawaii 5-0 not once, but twice (it was season 1 back then). And we tried surfing in Maui, which was lots of fun! Hawaii is somewhere I’ll be coming back to in my mind for a long time still. Nostalgizing over trips is almost like recycling – you don’t always need something new, sometimes the old will do just fine. I vote for Kaanapali Beach and Hanauma Bay. My dream is visit Hawaii. Those places make me dream even more. If you enjoy sun, sea and sand then it’s definitely the right place to visit! Can recommend it! Yeah… Hawaii is for sure on my bucket list! You work in that field? Not me. No way! I used to work in ESOL. But when he goes to conferences I get to see if I want to join him or not. one imagines that Hawaii doesnt have a shortage of great beaches, these all look sensational! They were! Great for a beach lover like me! Waimanalo is my favorite beach. It looks like you really got around while you were here. Thank you for posting. I loved Oahu and Maui so much, very grateful to have had a chance to see so much 😊 Thanks so much for your comment! Loved it, Hawaii is on the very top of my list, would loooove to make it there ! Looks amazing! wonderful pictures and descriptions! I long to go there!